The first book to explore the fascinating-and essential-world beneath our feet. There are over one billion organisms in a pinch of soil, yet we know much more about deep space than about the universe below. In Tales from the Underground, Cornell ecologist David Wolfe takes us on a tour through current scientific knowledge of the subterranean world. We follow the progress of discovery from Charles Darwin's experiments with earthworms, to Lewis and Clark's first encounter with prairie dogs, to the use of new genetic tools that are revealing an astonishingly rich ecosystem beneath our feet. Wolfe plunges us deep into the earth's rocky crust, where life may have begun-a world devoid of oxygen and light but safe from asteroid bombardment. Primitive microbes found there are turning our notion of the evolutionary tree of life on its head: amazingly, they represent perhaps a full third of earth's genetic diversity. As Wolfe explains, creatures of the soil can work for us, by providing important pharmaceuticals and recycling the essential elements of life, or against us, by spreading disease and contributing to global climate change. The future of our species may well depend on how we manage our living soil resources. 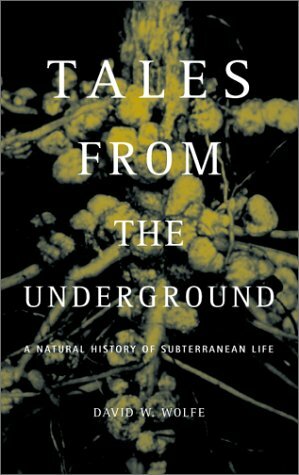 Tales from the Underground will forever alter our appreciation of the natural world around-and beneath-us.